After reading the newest chapter of Attack on Titan, I can say with certainty that it’s one of the best chapters in the series. Emotional and epic on so many levels, I haven’t felt this strongly about a chapter of Attack on Titan in a long time. What this chapter reinforces is just how much I love Eren’s character in the manga, but it also saddens me even more because of just how poorly his character is portrayed in the anime and live-action movies (can we just pretend the films didn’t happen?). Every time I have a conversation with someone about Attack on Titan, the general consensus is that his character is terrible and perpetually angry in the anime. “All he ever does is yell!”, they say. Most of the people I talk to about Attack on Titan don’t read the manga, so when I tell them that he doesn’t act like that all in the manga it surprises them. But to illustrate why the manga version is better than the anime version, I’m going to bring in a specific example of a scene that plays out very differently in the manga versus the anime because of how Eren is characterized. Let the death battle begin! Warning: If you have not seen or read either the Attack on Titan anime or manga, there will be major spoilers revolving around Eren’s character. Read at your own risk! In the finale of the Attack on Titan anime, Eren is forced to battle Annie and his inner turmoil after learning of her betrayal. He hesitates to fight her to the point that his friends are forced to place themselves in danger. What finally gets him to transform and aid them in the fight is not Mikasa’s, Armin’s, or even Jean’s words of encouragement and motivation, but being crushed by rubble and needlessly injured. 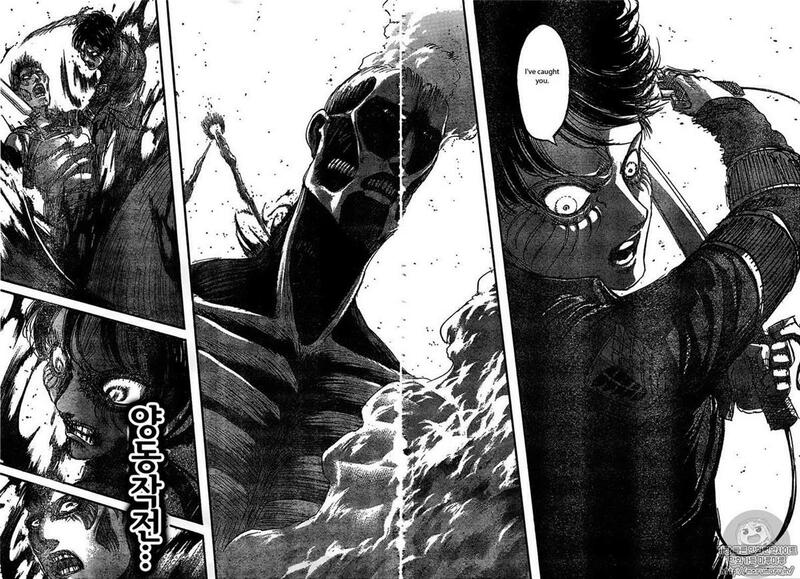 In the manga, Eren is hesitating to fight Annie because of their history as friends and sparring partners. 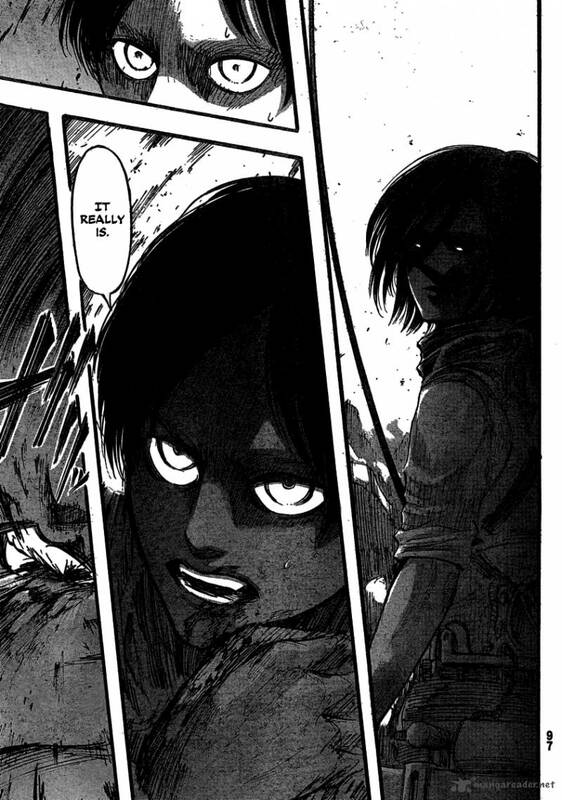 He’s having a hard time conceding that their trust is now broken, but Mikasa’s words are what push him to fight her. Because he transforms earlier and epically uppercuts Annie, his friends are not forced to put themselves at risk, and together they can all fight as a team to take down Annie. 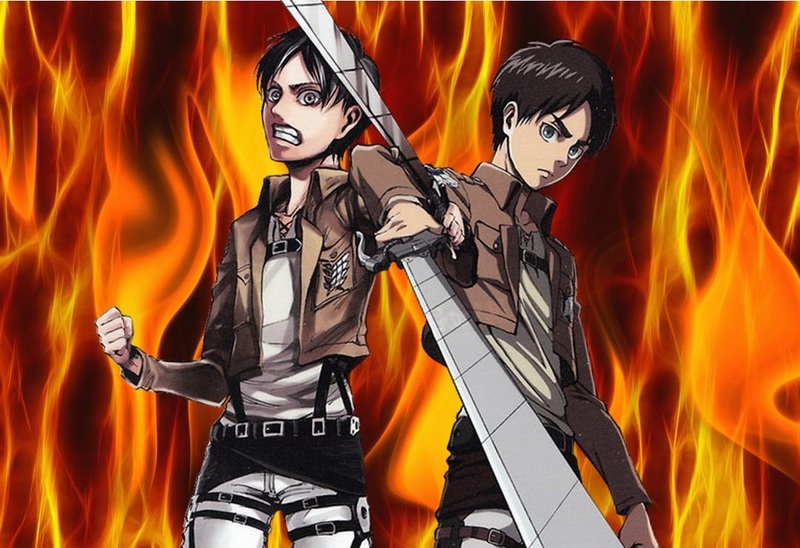 The manga version is much superior because Eren gains his resolution much more quickly, and it leads to a great battle. I would have loved to see this in anime form. The reason why the anime version of this scene is bad in comparison because it changes the foundation of his character. On the surface, the differences may not seem like a big deal – the transformation happens either way, so why does it matter, you ask? The reason it matters is because in the anime, Eren has no reason to be hesitating this much because of what happened in the Forest of Giant Trees. In that battle, Eren’s character was already being put down because he was forced to not fight back. Levi’s squad put his safety above their own, so when they die at the hands of the Female Titan, Eren blames himself and tries to avenge them. The Forest of Giant Trees battle plays out more or less the same in the manga and anime, so at this pivotal juncture when Eren can and should fight back so that no one else has to die, he completely freezes up in the anime. It not only forces more people to potentially die for him, but it kills the momentum of his previous battle with Annie and squanders his motivation without good reason. As a result, it makes him less apt to be a suitable main character and it’s largely responsible for why he is negatively received in the anime. Eren’s character in the manga is much more nuanced and interesting than his anime counterpart, largely due to just how much he grows and changes over the course of the story. Eren is not just an angry and screaming shonen hero in the manga. His anger is certainly a part of his core personality, and while it fuels him for much of the story, he learns a lot along the way and doesn’t let it completely define him. For example, early on in the battle of Trost, Eren’s unbridled rage at the death of Thomas and the recklessness that follows leads to his squad being devoured. However, he learned from his mistake – he no longer acts blindly and leads his allies into danger. They work together as a team, and because of this, they can minimize the casualties. He learns to use his anger as a weapon and not let it control him. This also applies to his Titan form as well – over time, he learns to control it and not be overcome with anger, often fooling his enemies with his expected, uncontrollable rage before proceeding to gain the upper hand by strategically using it to his advantage. Not only is Eren capable of thinking ahead and using his rage effectively, his compassion for his friends and comrades makes him a selfless character too. He is always striving to protect them as much as he can, even if it means sacrificing his own life for the greater good. He does this in response to the sacrifices that were made for him, and resolves to take control of the situation whenever he can in order to protect them further, highlighting his morals and maturity. Eren has always been guilty about the sacrifices made for him, but as the series progresses, he learns to accept that they sometimes have to be made for the greater good. These sacrifices were often consciously made so that he could live on and save humanity. Instead of blaming himself, he learns to trust in them and ensure that those sacrifices aren’t in vain through his own actions. This fact has become especially apparent in the most recent chapters of the manga. Armin chooses to act as a diversion, essentially a suicide mission, but Eren – understanding the high stakes of their situation and his role in it – doesn’t try to stop him because he understands what has to be done. 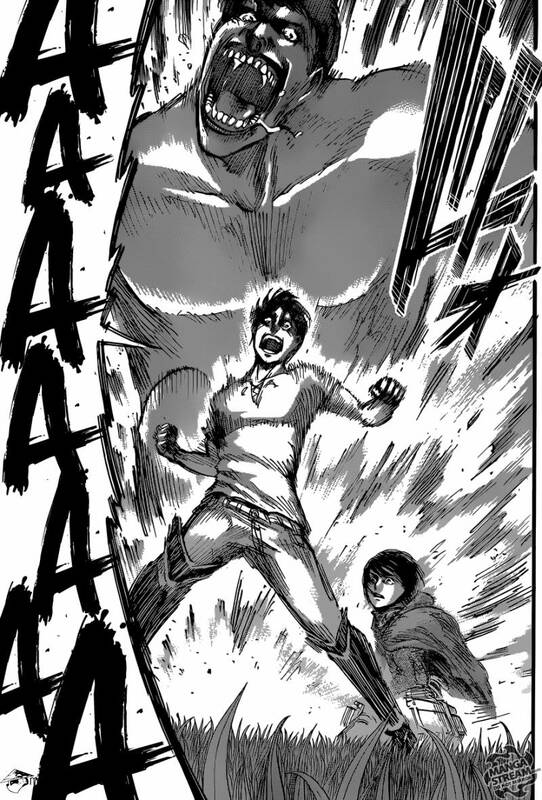 If this had happened at the beginning of the manga, there would be no doubt that he would have tried to stop Armin, or maybe even reacted recklessly and caused more harm than good. But through everything that Eren has experienced and learned throughout the series, he learns to accept sacrifices and become more trusting. Rather than being crazily angry or selfishly hesitating, he trusts wholeheartedly in his friend, knowing that his actions can change the course of humanity and make a difference. Manga Eren is really complex and interesting, and the fact that Anime Eren is nowhere near as developed is infuriating. Not only did he not grow at all in the anime, but he constantly acted selfish and more like a crazed monster than a true friend and ally. Putting his friends at risk is not something Eren should not consciously do. It makes him a weaker and unlikable protagonist to follow because of how selfish and angry he acts. And instead of learning from his mistakes and trying to make a difference, he often doubts himself and lets other characters fight for him when he should be able to. This isn’t to say that Manga Eren doesn’t doubt himself, but unlike Anime Eren, he internalizes his doubts and puts on a brave face because that’s what he has to do. He understands the world needs him and his capabilities, and he’s not going to let humanity down for a second. 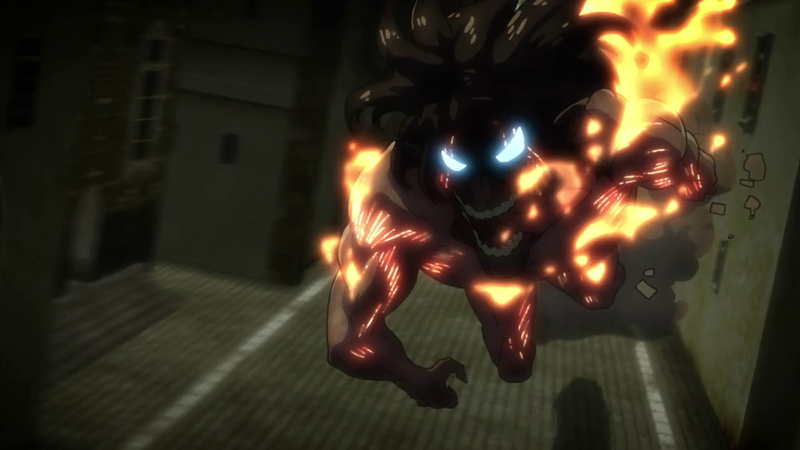 So if Eren’s character is so great in the manga, why is he so different in the anime? Why were these changes made? Part of the problem is Hajime Isayama’s own views about Eren. Isayama does not like Eren’s character – he claims to have created him out of “necessity” for the plot, and therefore finds him unrealistic. As a result, he pushed the anime and movie studios to make Eren seem weaker and more afraid in order to seem more “realistic”. While I can sort of understand why Isayama isn’t fond of Eren’s hot-headed personality, it’s important to remember that Eren’s character in the manga is still adored by many fans. Eren may be like the typical shonen protagonist, but he is loved for that reason because he is a strong, worthy protagonist. And it’s not like he doesn’t have flaws in the manga. He makes mistakes. He gets upset. He’s afraid of the titans just like anybody else, but his anger and desire to protect others and see the outside world overrides that fear. He is still just as compelling as the rest of the cast because of his resolve. For this reason, I disagree with Isayama’s claims that Eren is not a good or realistic character – Eren is a great protagonist because of his strength of will. That is what makes his manga counterpart the stronger, better character – he doesn’t have to be a weak, selfish character like he is in the anime to be interesting or realistic, because he already is. There’s much more to Eren in the manga than just anger and selfishness, because he learns from his mistakes and is always striving to do better no matter what. He doesn’t give up, no matter how many times he loses, and it’s an admirable trait that should be recognized more than it is. My hope is that in the second season of the anime, Eren will become a more developed and interesting main protagonist not just bent on killing all of the Titans and being angry. He can still have those qualities while being a strong protagonist who matures and has a lot of epic moments. Like this. I need this in the anime. Make it happen, Studio Wit.